us president Barack Obama has set in motion a national policy that is expected to make cars and trucks in the country 30 per cent more fuel efficient by 2016. The policy is also expected to cut 900 million tonnes of greenhouse gas (ghg) emissions from vehicles between 2012 and 2016. This is equal to taking 177 million cars off America's roads. The move has come after two decades of allowing oil-guzzling in the auto sector. The target is to reduce ghg emissions from the current fleet-wide average of 219 grammes/km for new vehicles to 155 g/km by 2016. The fuel economy level of passenger vehicles will be increased to 35.5 miles per gallon (15.09 km/litre) between 2012 and 2016. This will compel auto makers to improve fuel efficiency by 5 per cent every year.The previous administration had put off the implementation of these targets to 2020. It is the first time the federal Environmental Protection Agency (epa) will control ghg emissions under the Clean Air Act. Until now the Act was controlling only health-threatening air pollution. Now it will control not just the CO2 exhaust directly linked to fuel burnt, but also other warming gases. These include methane, nitrous oxide emissions from catalytic converters, CO2 emissions from car air-conditioning and hfc or refrigerant emissions due to leakage from car air-conditioners. Emissions associated with the production of fuel used by vehicles will also be regulated. The administration expects to save 1.8 billion barrels (208 billion litres) of oil over the life of the programme. The saving represents seven-eight per cent of the fuel consumed by vehicles in 2016. As old vehicles are replaced with new ones, fuel savings will increase further. Even after meeting these targets the US in 2016 will not catch up with the levels Europe and Japan have already achieved. It will only match the current fuel economy level of China. 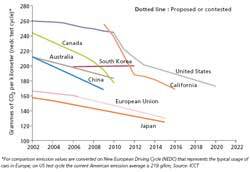 This is evident from the comparison of ghg emissions from new vehicles across regions done by the US-based International Council on Clean Transportation (icct) that has been pushing for these regulations (see graph on the next page). "The US is starting the push from far behind in the race. New cars in the country are still, on average, 50 per cent heavier than Europe's cars, and have 75 per cent more power than Europe's," Lee Schipper, transportation expert at the University of California, Berkeley, said. Cheap fuel, obsession with big, powerful cars and weak climate mitigation had blocked the country's progress towards fuel efficiency. Despite taking the lead in setting fuel economy standards in the wake of the 1973-74 oil crisis, the US lost ground after the 1980s. It failed to update and tighten the standards with new technologies. Transportation experts point out the key element of the new rules is that they require sharp improvement in a short period. Said John German of icct "The Federal government may not have done anything in quite a while. But it is now on track. From 1995 to 2015, while Europe will increase the fuel economy of its fleet by 42 per cent, the new US rule will bring a 30 per cent improvement in five years." If the air-conditioning improvement is not taken into account the US annual improvement during 2011 - 2016 will be 5 per cent, against 1.8 per cent for Europe between 1995 and 2015. "That's close to three times the rate of Europe," said German. US sprints, but when will it leap? The new policy has helped resolve a dispute that marred progress towards ghg emission standards in the US. California has stayed ahead of the rest of the US in air quality regulations, thanks to a special permission given by epa under the Clean Air Act to set tougher than national standards. The state has also pushed for imposing its own ghg limits. But epa denied permission, saying California did not experience any unique or unusual risk from climate change. Some states sued epa for failing to limit ghg emissions. In 2007, in response to the lawsuits the country's top court directed that ghg emissions are air pollutants and can be regulated under the Act. But epa will have to determine that ghgs endanger public health. California still needed the permission. Negotiations over the new rules resolved this tangle. epa has put out a draft that examines public health risks from climate change and proposes to set national ghg standards, which are the same as California wanted. California agreed to defer its demand to set own targets. Auto makers, who did not like California's proposal to set its own ghg standards for vehicles, have had to accept the new federal laws. The auto industry had sued California, claiming the state had overstepped its authority. It argued that CO2 emissions are linked to global warming and such standards are tantamount to having fuel economy standards, which only the federal government can impose. It also sued other states that opted for California's proposal. The industry opposition is now partly diffused because the new rules will be uniformly enforced across the US. "Sharp emissions cuts needed in a short period in the US market, dominated by big petrol vehicles, will need significant technological advancement," US vehicle technology expert Michael Walsh said. This is a little different from other markets that tend to have smaller and less powerful vehicles, including the diesel ones, that make their fleet more fuel efficient. US auto makers will have to work on gasoline engines, bring more hybrids as the rate of improvement needed is high. Vehicles may also get lighter with lower power and acceleration. Diesel cars that are relatively more fuel efficient may see a moderate growth in the US. European manufacturers are pushing diesel vehicles. American and Japanese manufacturers are less aggressive on diesel vehicles in the US market. Limited supply of diesel and diesel prices that can be more than gasoline have prevented growth in the number of diesel cars in the US. In India and Europe diesel is cheaper. "Indeed, Ford, GM, Chrysler, all have strong positions in the European market, meeting their tighter CO2 emission limits. Therefore, their challenge is selling a European-style mix of power and weight in the US market," Schipper said. While major vehicle-producing regions, including China, have begun to regulate fuel economy or CO2 emissions from vehicles to become energy and climate secure, India is yet to take the first step. The Indian car industry has lobbied to block such regulations. The industry's programme of voluntary declaration of fuel efficiency began in January 2009 to stave off criticism for not sharing fuel economy data with consumers. This is not backed by an official programme. India has an advantage its overwhelmingly small-car fleet. The CO2 equivalent of its fleet efficiency is estimated at 140-145 g/km by industry and research bodies. This is better than the current European level. But India is on the verge of losing this advantage since the number of cars is exploding and there is a shift towards bigger cars and suvs. To make it worse, the auto industry has mounted pressure on the government to waive off the special excise duty on suvs. If the government gives in, the fuel economy of the fleet will plummet, shooting up oil consumption. Early this year concerned Union ministries decided to have mandatory fuel economy standards and a fuel efficiency labelling programme for cars to strengthen energy security. The consensus could be reached after the Prime Minister's Office (pmo) intervened. The Bureau of Energy Efficiency, an autonomous regulator under the power ministry, will develop the standards and the labelling programme. Enforcement will be the responsibility of the shipping, road transport and highways ministry. In early June the pmo sent a letter to the power ministry asking it to expedite fuel economy standards. The Indian auto industry cannot escape these regulations. But it is insisting on having them on the basis of CO2 emissions and not mileage that consumers understand. The National Climate Action Plan and National Energy Policy have attached primacy to energy security and asked for fuel economy standards in mileage terms. This will also help in climate mitigation. The regulations need to be hastened. Most increase in India's fuel consumption by 2030 will be driven by light-duty vehicles, mainly cars growing at an annual rate of 10 per cent. The challenge in India is to protect the current baseline and not get isolated in the global race.